Today wasn’t much fun honestly. I spent most of this morning sawing out the rest of the pieces of the first packet, and was really struggling to follow the line with the saw. Besides the obvious difficulty of cutting on the line, there is the added challenge that as you cut around a section it becomes loose in the packet and you have to tape it back in place and support it as you go. If you move the saw and any part isn’t adequately supported, the pieces break and shoot out the back. Ask me how I know. Luckily we’re able to balance the Joy of Sawing with the Thrill of Crawling on the Floor Looking for Broken Bits of Veneer. 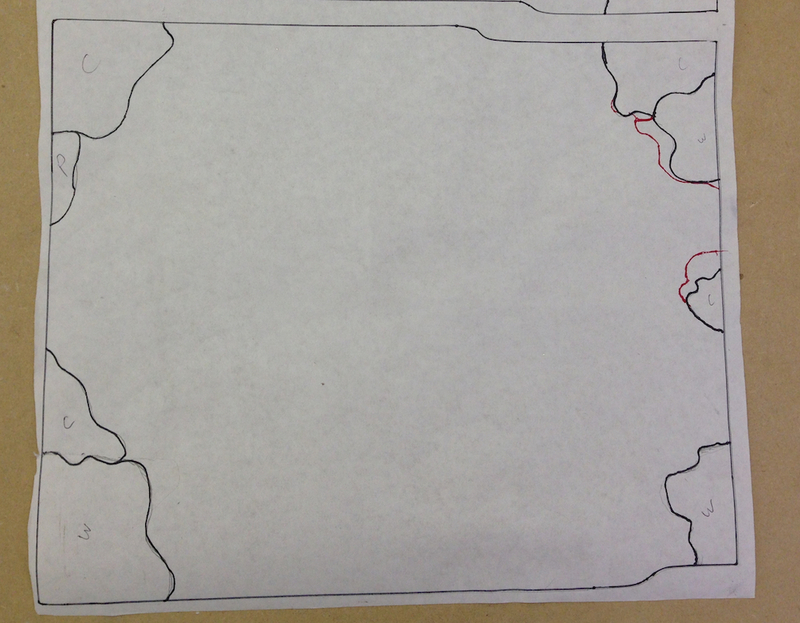 The challenge this morning was mapping out how we’re going to cut out the central area of this project. The parts have to stay in the packet after cutting to support the surrounding parts. Without falling out, and without slipping between the other layers and getting re-cut as part of another line. The order of cuts, turns and backtracks is carefully orchestrated. Add in several strategic scotch tape reinforcement operations and you have a formula for a stunt that ranks up there with some bizarre yoga headstand. We started with a strategy session on sawing, mapping out the direction and order of cuts. The double-ended arrows indicate “traverses” where you cut past an intersection, then back up generally two intersections and cut around from the other direction. Sometimes the saw seems to have a mind of it’s own. I’ll be right on the line, then I’ll be way off the line – just that fast. It’s frustrating, I feel like a preschooler who wandered into college calculus. In fact, it reminds me far too much of attending college calculus. 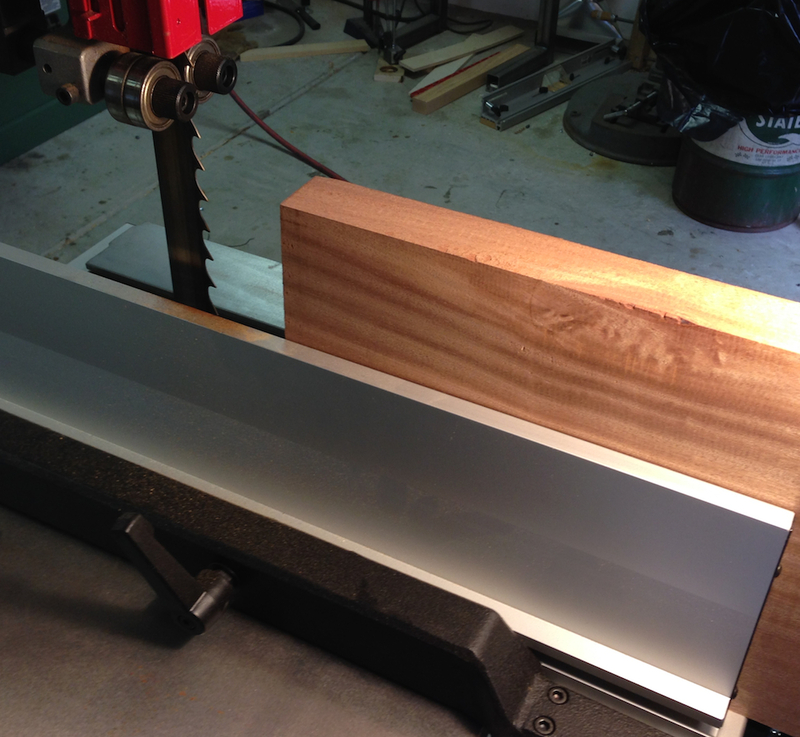 OK, first please integrate , then saw out some tiny parts from 1/28″ thick veneer using a blade that is .010″ thick. 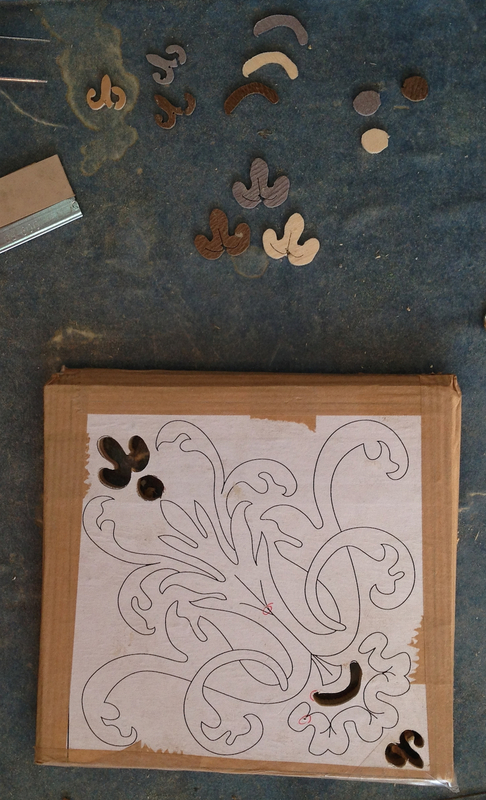 After lunch we opened up our packets, prepared an assembly board and glued all of our misshapen bits of veneer face down onto some kraft paper. 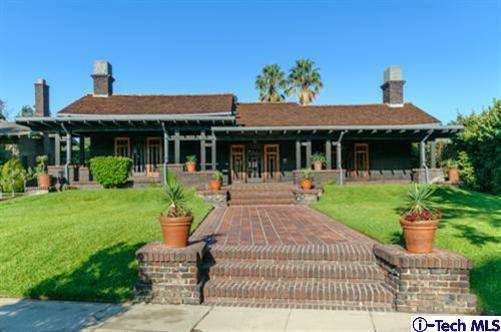 I’m not sure what the next step is, hopefully soaking it in petroleum distillates and lighting it on fire. We started in on our next next project, drawing our own faces by tracing a high contrast printout of a photograph. I don’t like having my picture taken, so having to saw out a marquetry packet of my own image is some kind of sadistic double-whammy. Hopefully tomorrow will go better. Materials for the next project. 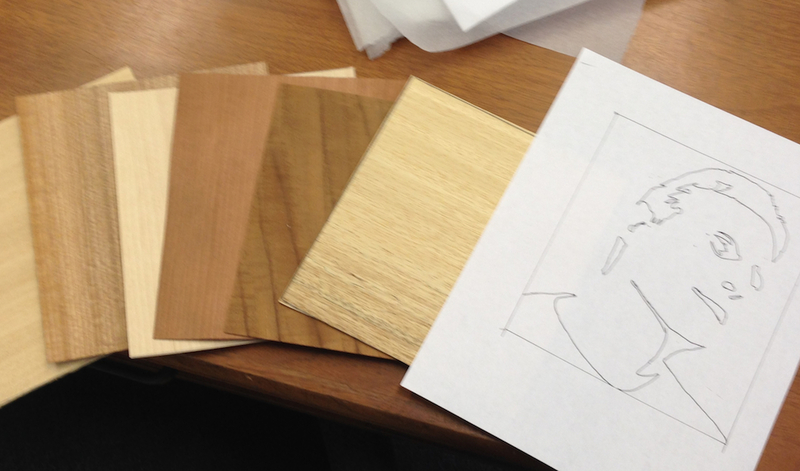 3mm backer board, 1.5mm front board and four contrasting pieces of veneer to make four portraits. I’m not clear who would want one portrait of me, much less four, so I’m not sure I understand the point here. 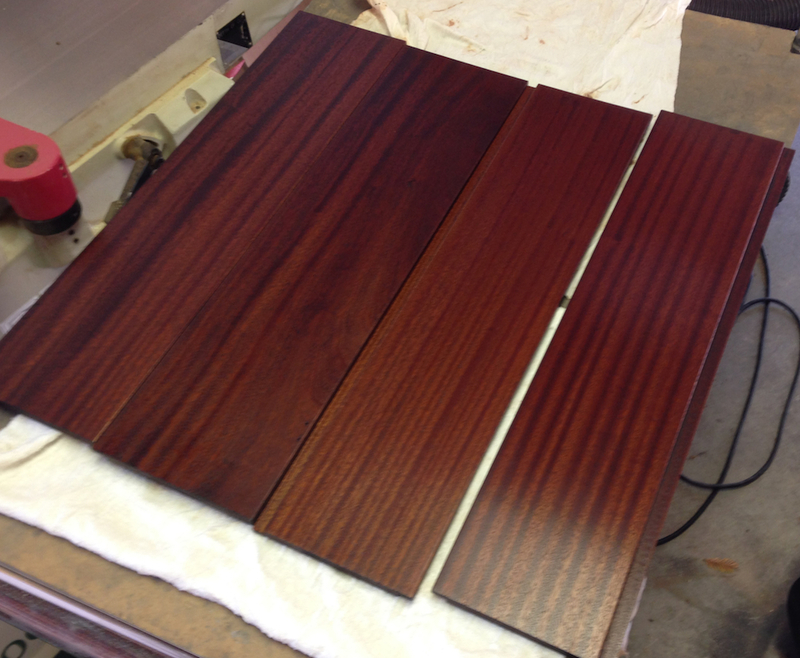 I got a couple of hours in the shop yesterday and made a good start on the G&G power strip. This is supposed to be a “quick and dirty” project, so I hope it doesn’t take on a life of it’s own. We’ll see. I made good progress, although there are still a couple of time consuming details left on the boxes themselves — shaping the ends of the finger joints after using a round over bit seems to take longer than you’d ever expect for example. Anyway, here is where things stand right now. 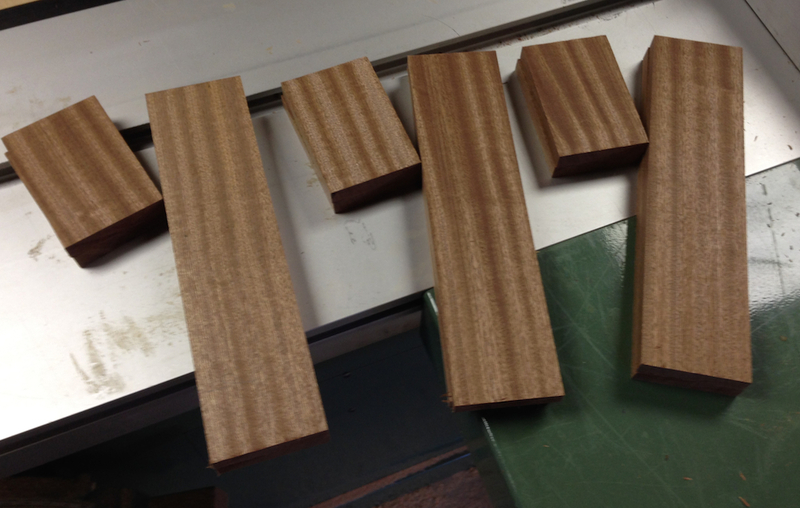 I started with an off cut of 6/4 Sapele left over from a recent project. It was about 15″ long, so I figured I could get enough for a couple of power strips from it. I faced one side so it was flat, and one edge so it was square to that side. 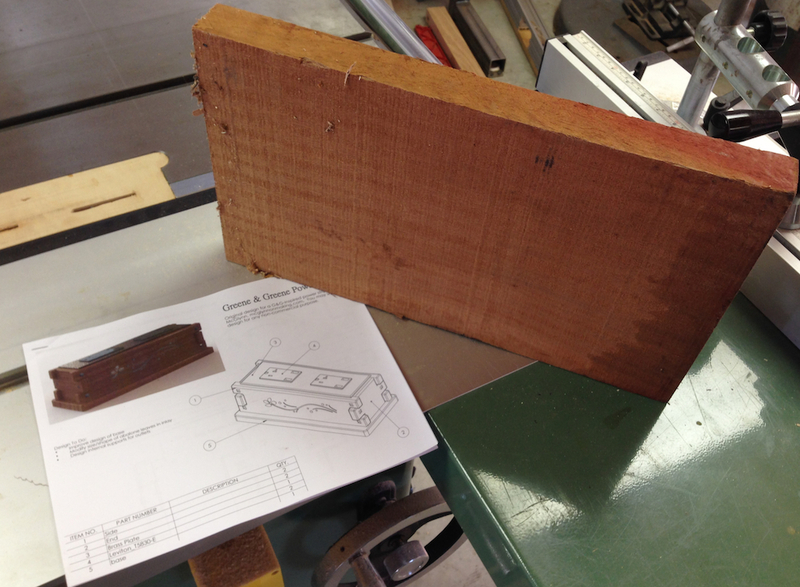 Then I resawed it into two pieces about 5/8″ thick. 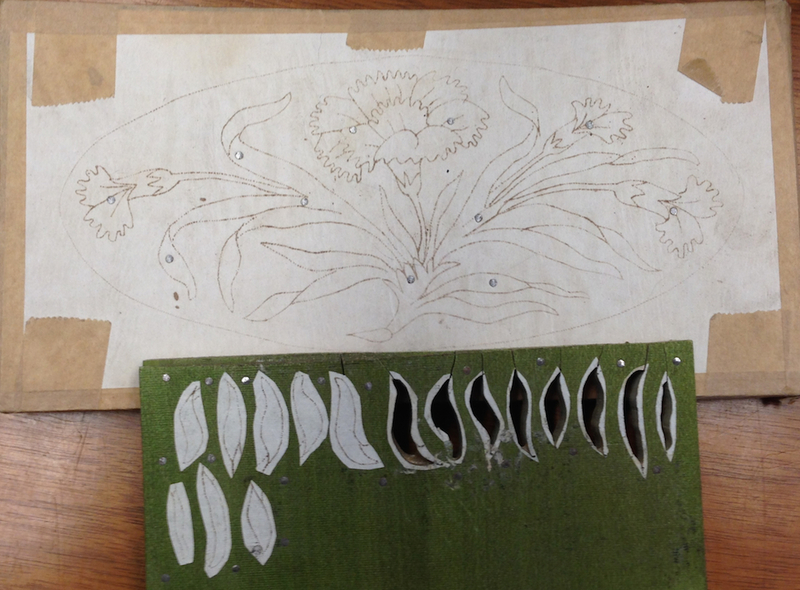 These I jointed and planed flat, thicknessing then to 1/2″ exactly. I ripped the two 1/2″ wide boards into 2/5″ wide strips, then cross cut them to the lengths necessary for the sides (10″) and ends (3.75″). Since the grain on the sapele is pretty consistent I didn’t worry about trying to keep it continuous around the four sides for each box. 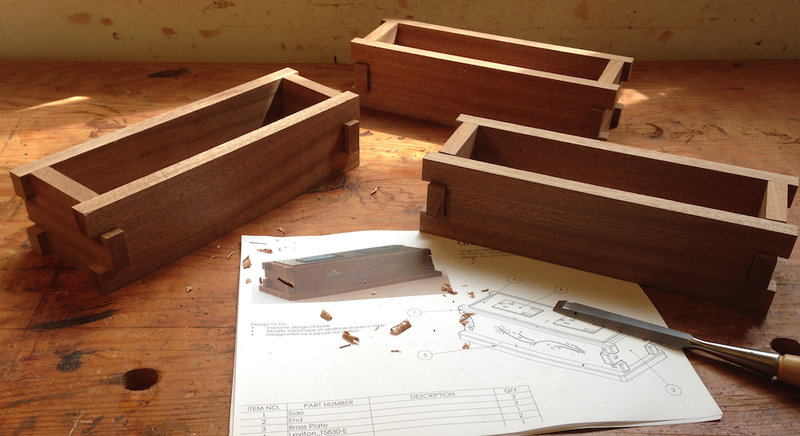 Finally I laid out the fingers for the joints, 1″ on the ends and 3/4″ wide on the sides. I cut them close and pared them to fit, everything is nice and tight. I did a bit more, laying out the locations for the ebony pegs — twelve to each box — and starting to round over the ends before I called it quits. I won’t be able to work on these until next weekend again because I’m about to pack up and drive to San Diego for a week long class in Boulle Marquetry. On the way I hope to stop in LA to look at some original G&G stuff. I’d like to be on the road in an hour, so time for a cup of coffee and then I need to roll. I only have a little time before I leave town for the marquetry class tomorrow, but I wanted to start on a couple of new projects in the shop today. 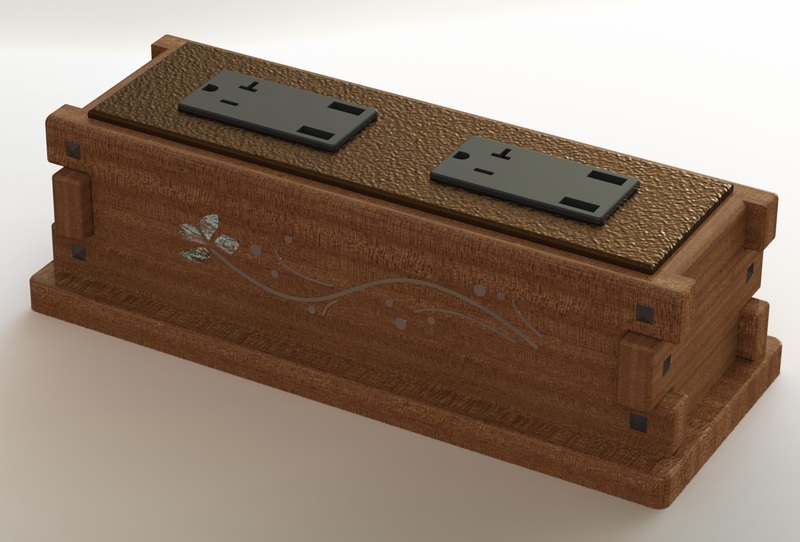 I threw together some plans for the power strip I designed, I’ll see if I have enough scraps to make one or two of these. There are some details I want to adjust still, and I don’t have the materials for the inlay, but what the heck? Again, with apologies to Derek Jacobi (for the CAD file pun)…and credit (blame?) to Ralph at the Accidental Woodworker for the inspiration, I’m pleased to present another random synaptic misfire. 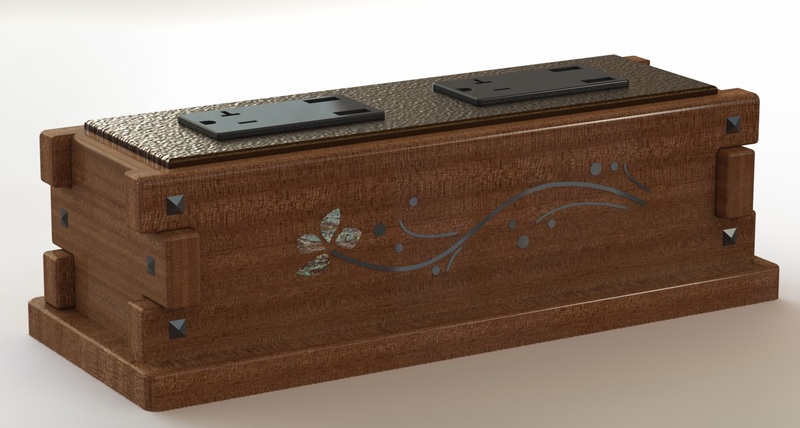 I’m actually kind of excited about building this, it will be a great chance to practice my inlay work, and should be a relatively quick project. Less than two months I’d bet, but don’t hold me to that. Nothing too complex, and I can make it from scraps left over from recent projects. 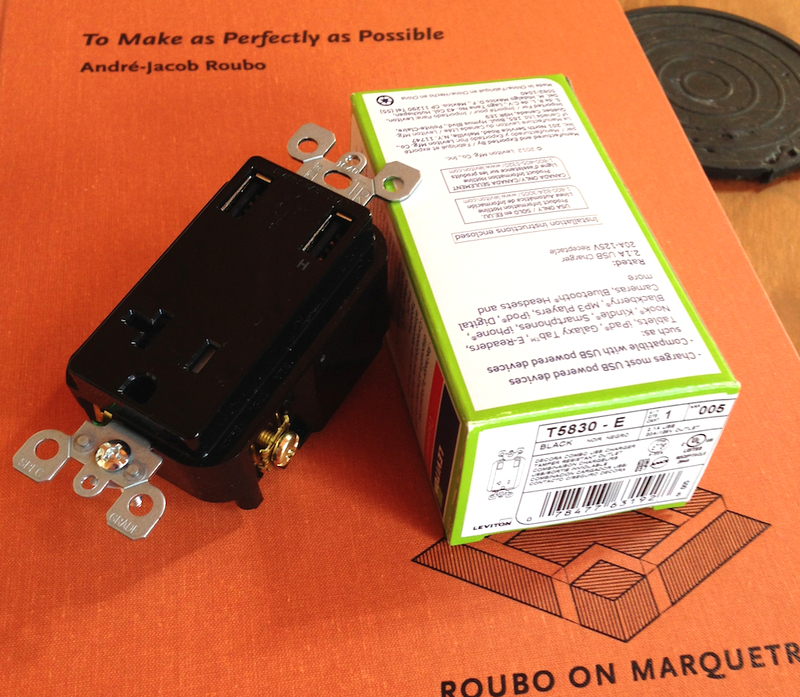 The starting point for the project is the Leviton plug. It’s rated for 20 amps and has one standard 3 prong grounded outlet and two USB charger outlets for the Apple devices that seem to be reproducing everywhere in my house. I bought two of these through Amazon, they weren’t available locally. I specifically wanted black because of the style I’m headed towards. 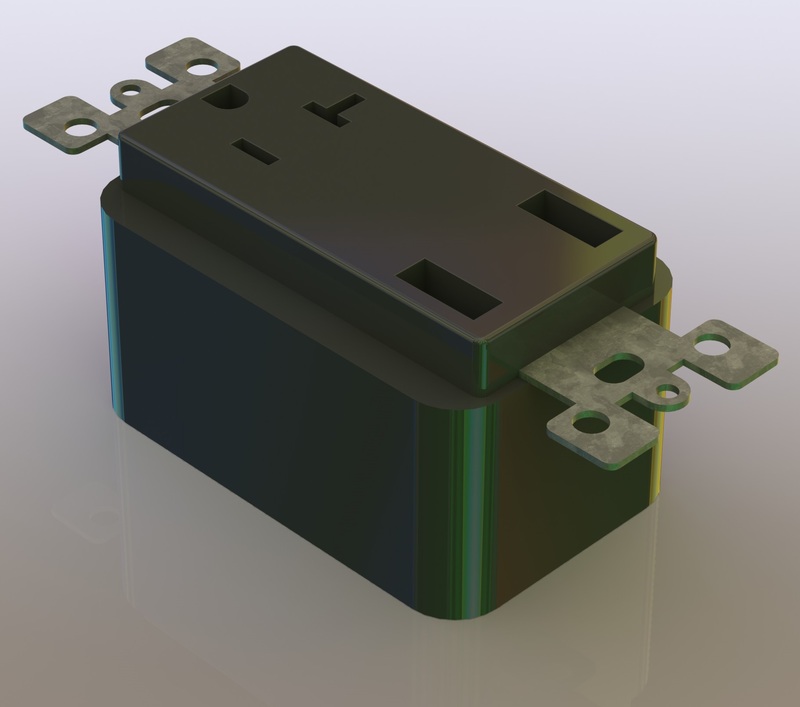 I started by modeling the plug in SolidWorks so I had a virtual outlet to play with. I settled on using two of these, both for the scale and because they are a little pricy, at least compared to standard 110 outlets that are only a couple of bucks each. I tried a couple of arrangements, and settled on an inline layout. 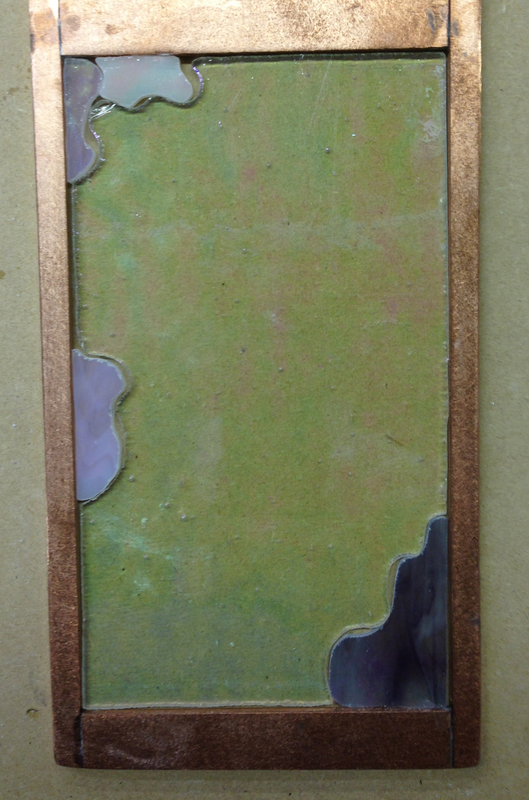 I sorted out the proportions and modeled sides, a base, a brass top and some spiffy inlay in silver and abalone shell. I haven’t figured out the exact mounting arrangements for the outlets and brass top — I may end up putting a couple of screws through the brass top plate. I’ll probably use some vintage cloth covered cord for the extension cord to the wall outlet. I’m not happy with the base and will likely change it when I have a better idea. I know it’s a goofy idea, but I like it. 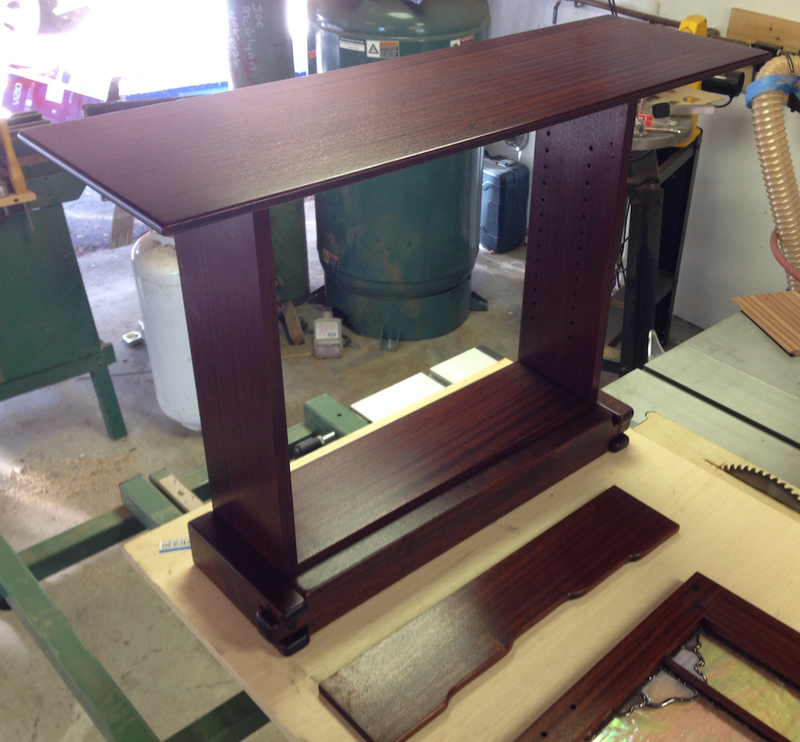 I wrapped up the assembly of the Thorsen cabinet, finally, yesterday. Rubbing out the parts, installing the stained glass and doing the final assembly all went without a hitch. 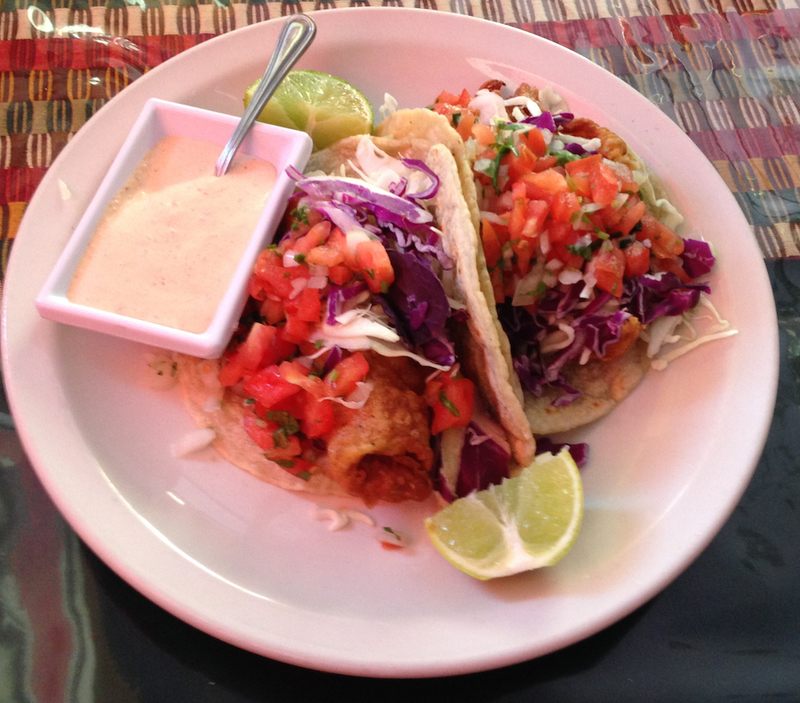 I wasn’t able to get a good picture of the completed project — only mediocre ones. 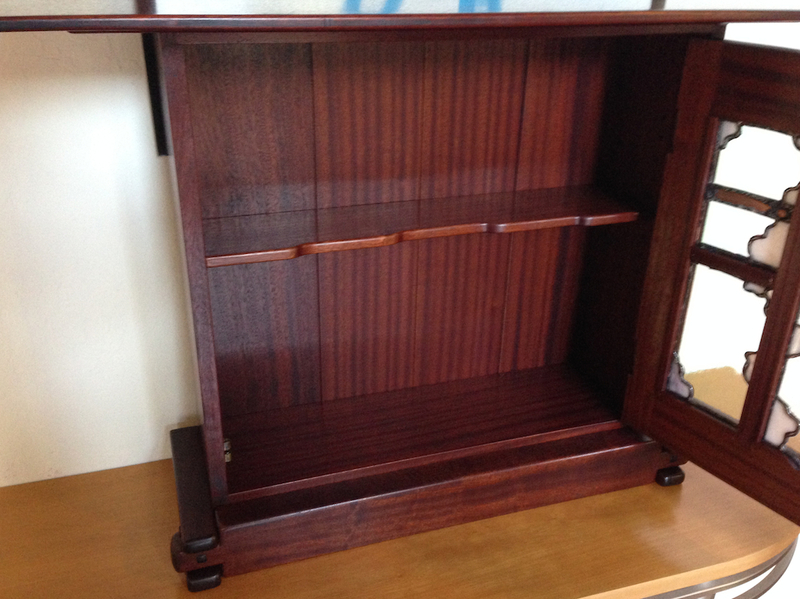 My camera phone doesn’t do well with a lot of contrast and the dark cabinet needs a lot of light to photograph well. First off, I rubbed out all of the parts with 0000 steel wool and black BriWax. The was goes into the pores in the wood and adds a bit more color. I’ll probably topcoat it with regular paste wax later for protection. I installed the stained glass into the door using the wood retaining strips I’d made, securing them with my pin nailer. Once the parts were all finished it was time to assemble it. First the back was screwed in, then I hung the door, and that was it. Why did this take me all day? I did waste some time trying to match the patina on the handle with the hinges, but I couldn’t get the hinges to darken properly. I’ll have to read up on patinas, I thought I understood the process. Then I hauled the project into the house. I haven’t hung it yet, I decided I need to repaint the wall where it’s going…which will lead to repainting the room, and god only know what that will lead to. 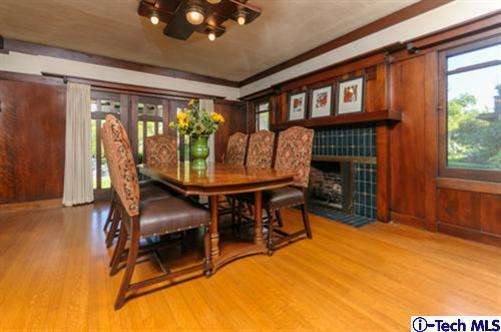 I actually want to make paneling for the room to match this cabinet, in the style of the Thorsen house where it follows the outline of the cabinet. 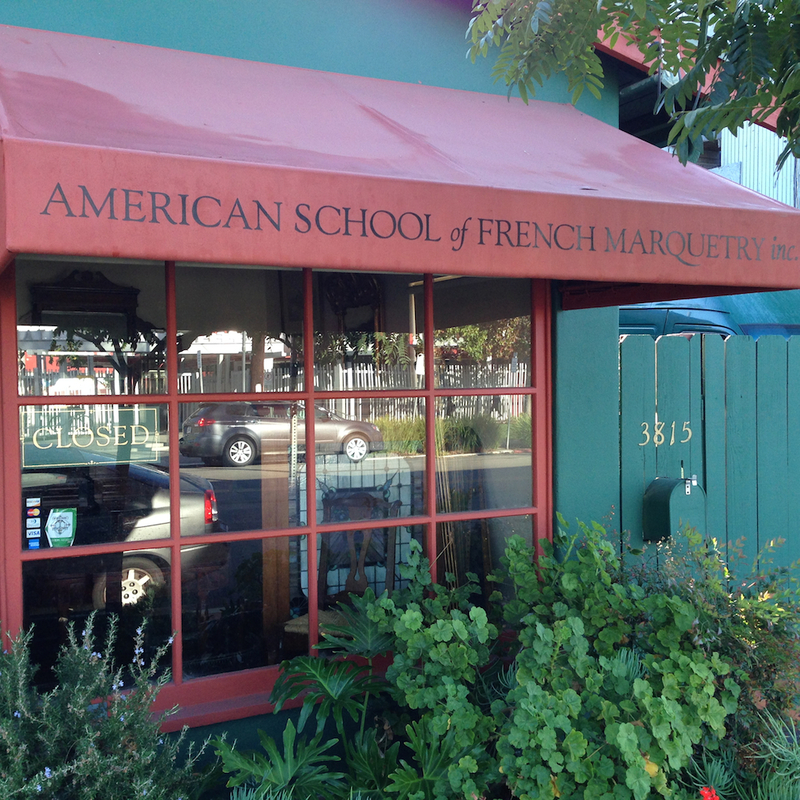 But first there are six other projects I want to do, so we’ll have to settle for a fresh coat of paint for now. My photography skills notwithstanding, I’m really happy with the finished project. There are (always) a few things that I see to improve on in the next project, whether it’s proportions, construction or finish details of course. But I try not to dwell on the minor glitches and enjoy the overall result. 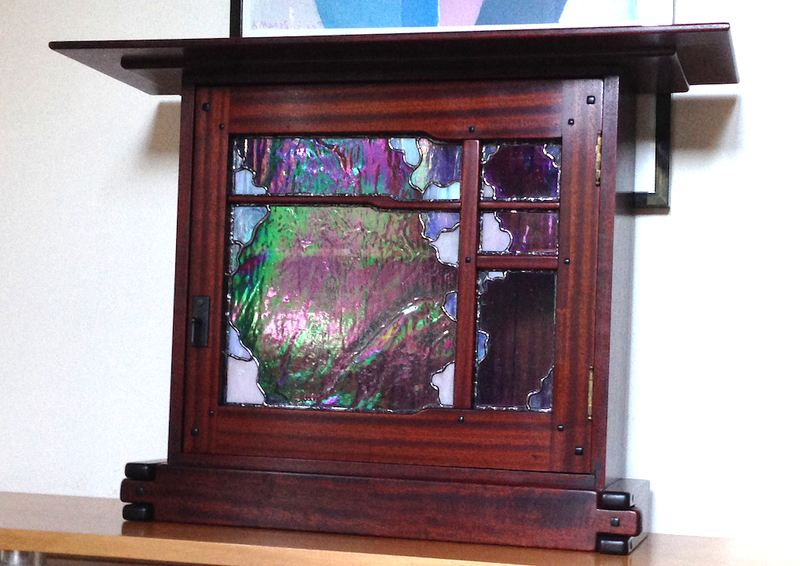 I wrapped up the stained glass for the Thorsen cabinet today, leaving just the rub out and final assembly for tomorrow. The glass took longer than I expected. 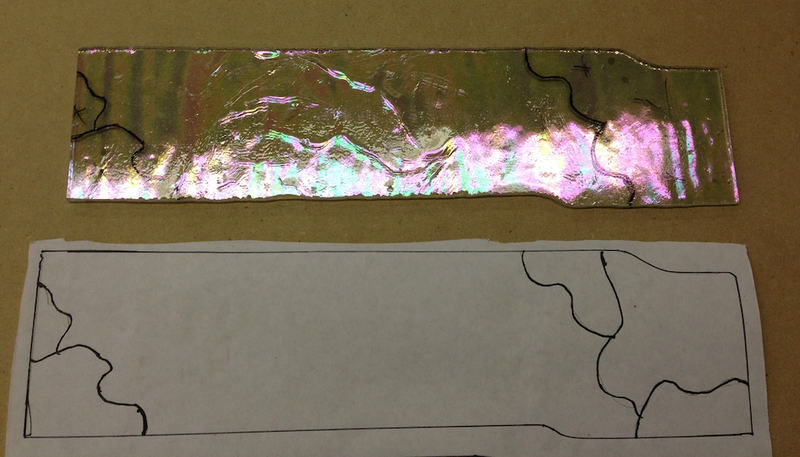 The process, once all the pieces are cut and fit, is to clean them, add the copper foil tape and solder them together. Sounds simple, and it is. 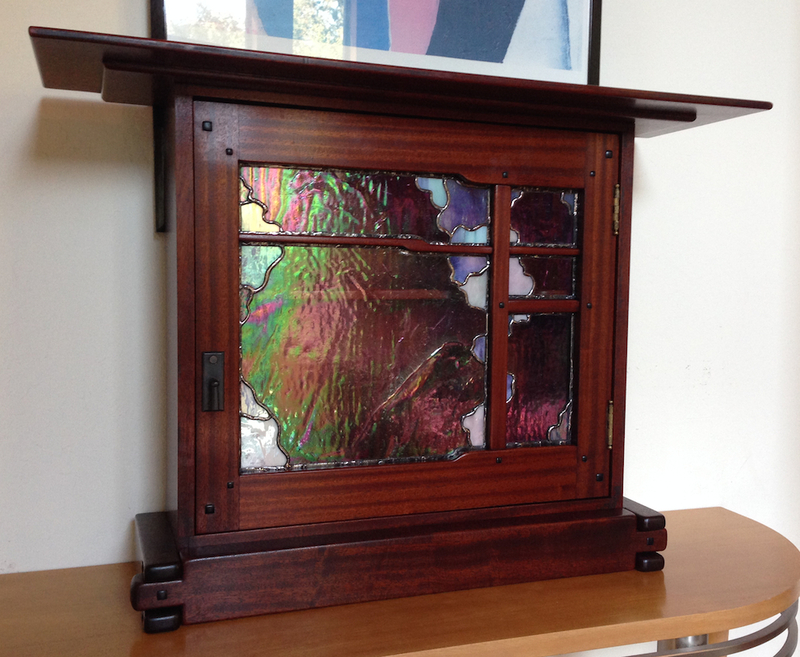 It takes some time to do the steps, but what really soaked up the time (and heat) was the copper frame I made. 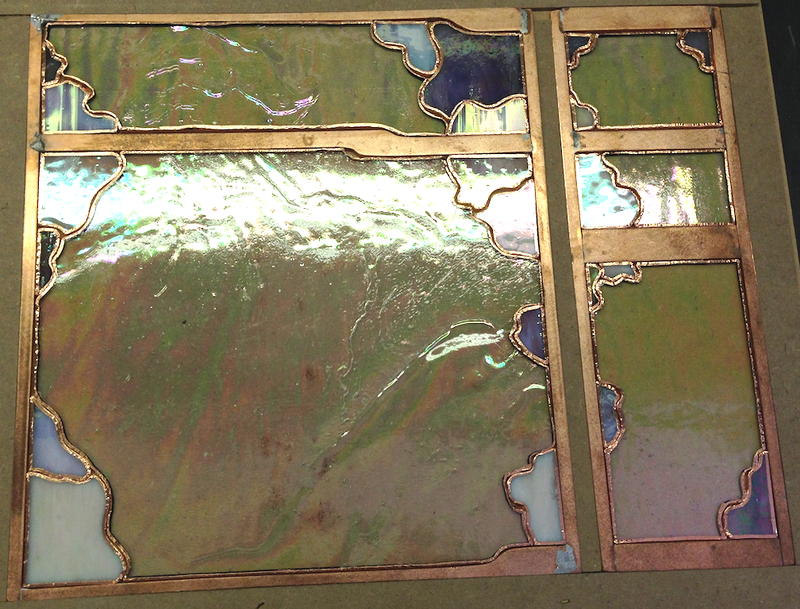 Glass cleaned and copper foil applied and burnished down. 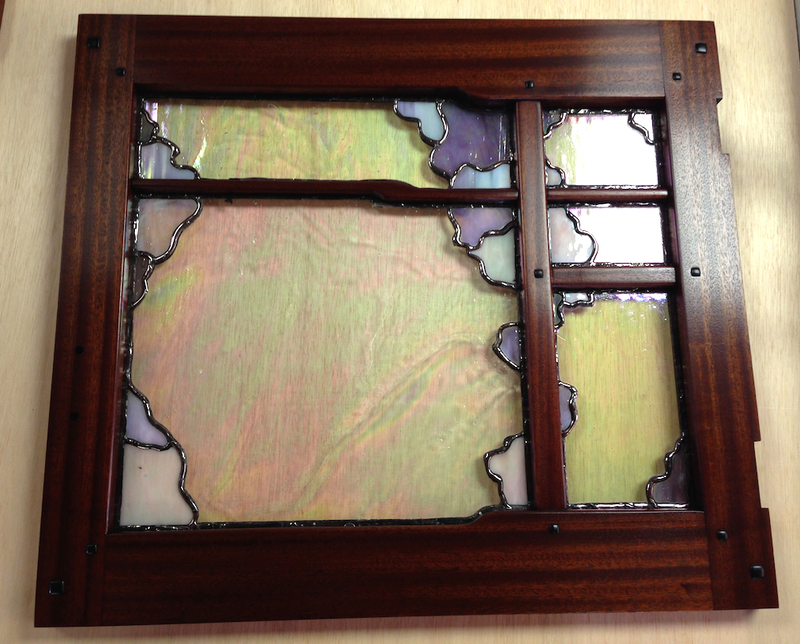 Rewinding: I made a copper surround for the stained glass, because I wanted a solder bead around the periphery of glass. Copper is a great conductor, and it really pulled the heat out of my soldering iron. I’ll have to get a bigger iron before I do this again. 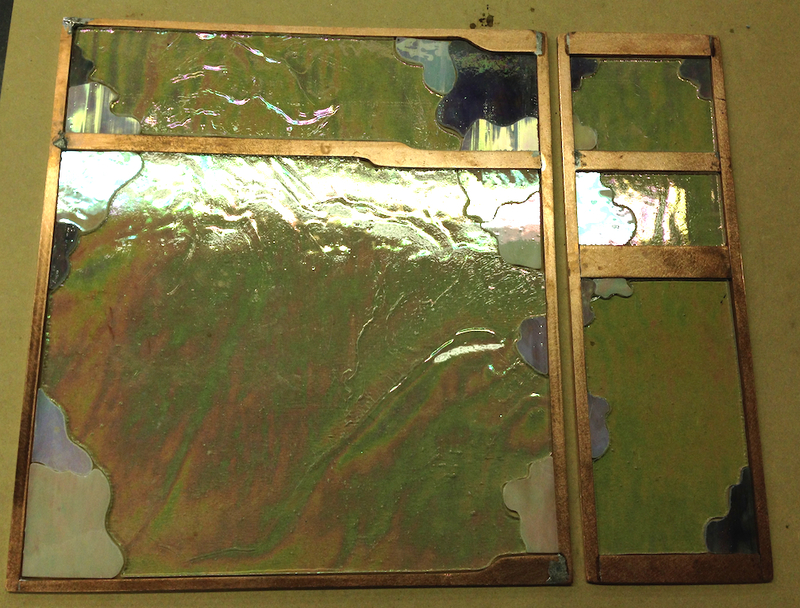 The one I have has plenty of power to solder glass, but not really enough to solder a copper frame like this. 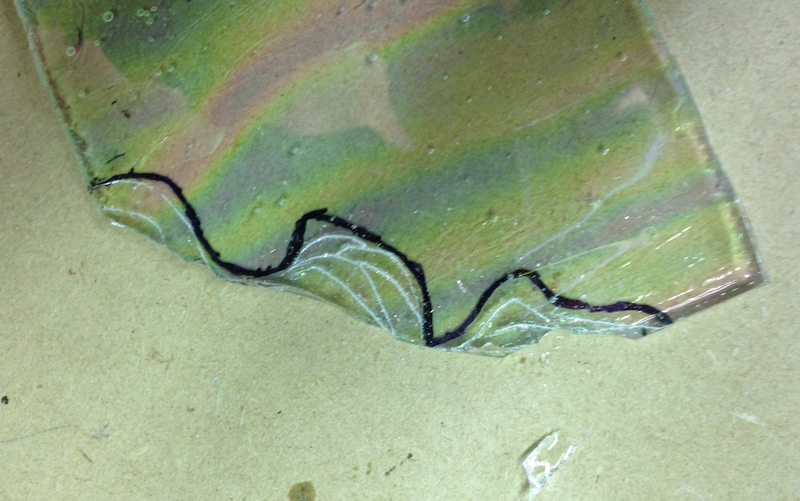 It took a long for the copper to heat up enough so I could flow in the solder, and I had to move really slowly. 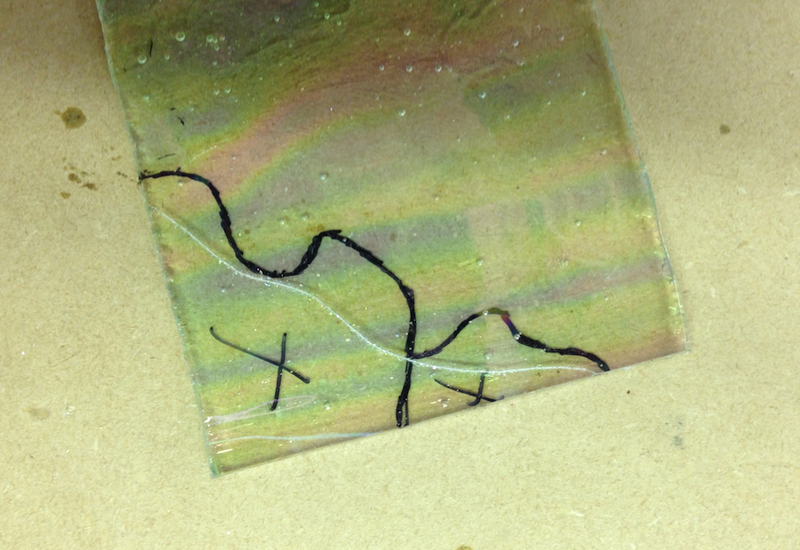 This made my solder seams along the copper a little sloppy, although they don’t really show in the finished cabinet. It sort of reminded me of my first welding project when I was a kid. I had a ’73 Pontiac Firebird and I wanted to put a roll cage in it. I bought an oxyacetylene welder and used that to weld the tubing in. If you’re not in the know about welding, that’s not the typical way to do the job. I had to use a giant tip on the torch. It felt like I was welding with a forest fire, and it took forever for the metal to get hot enough to form a puddle. The roll cage came out looking good, and I think this will be ok too. 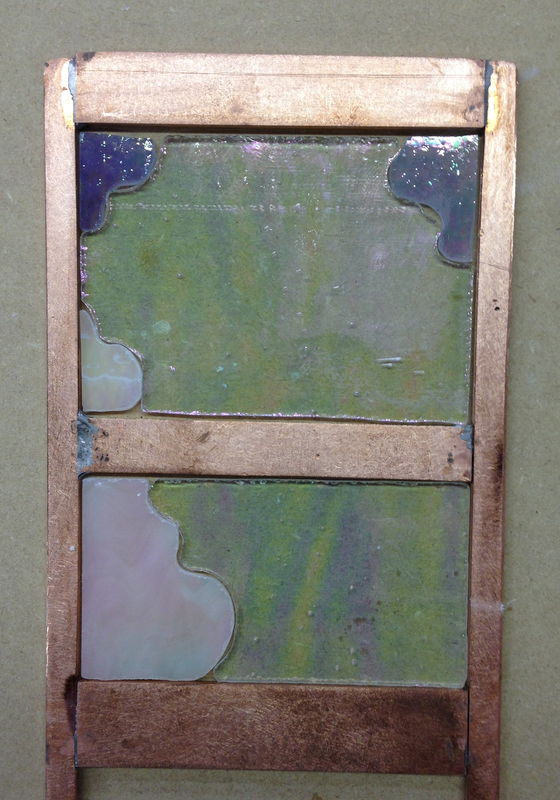 Soldered…a little sloppy where the glass meets the copper framework, but not too bad. After soldering I scrubbed the assembly to get rid of the flux. 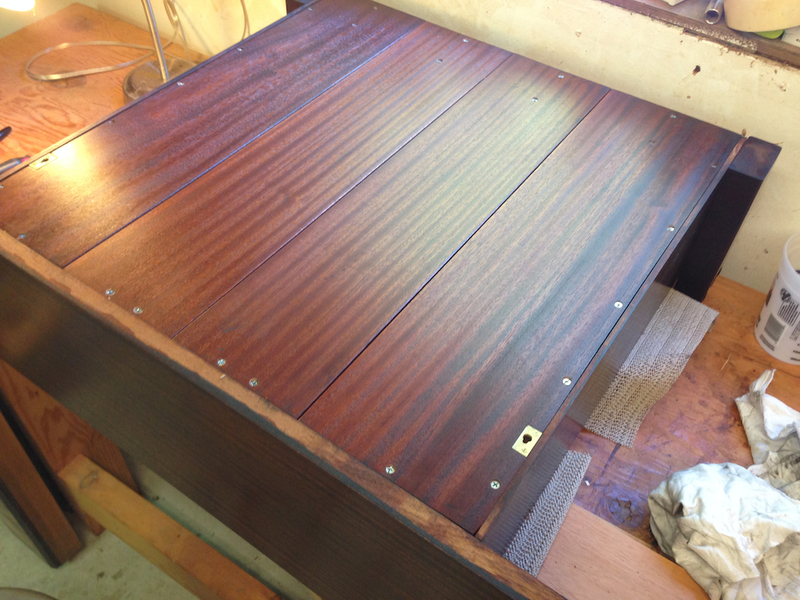 Then I applied a black patina, and polished the seams. 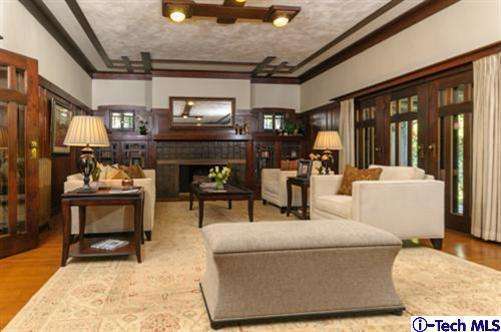 This shot is with the cabinet door sitting on top of the glass panels. They aren’t installed yet because I still need to rub the finish out. I got a couple of hours in the shop before it got too hot to work today (when is the weather going to break anyway? 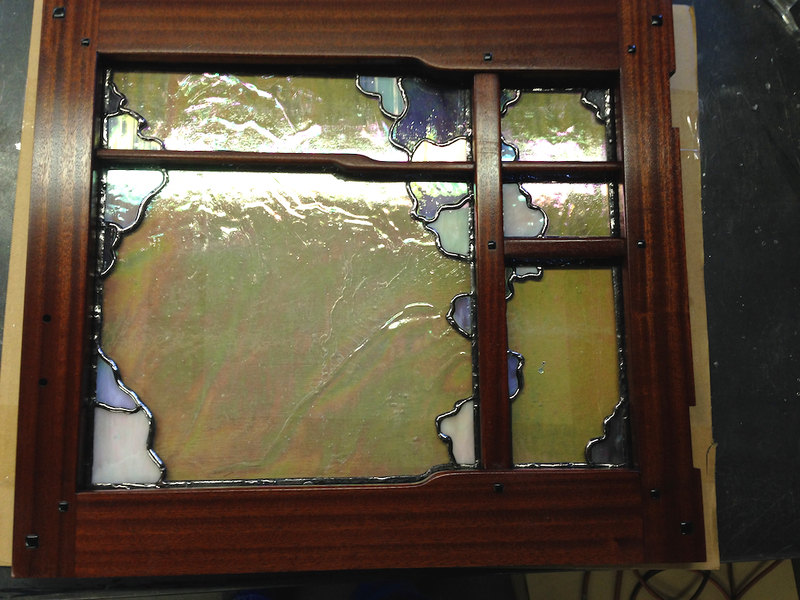 ), and made good progress on the stained glass for the Thorsen cabinet door. If I could get a solid day in the shop I’d be long since done I think. 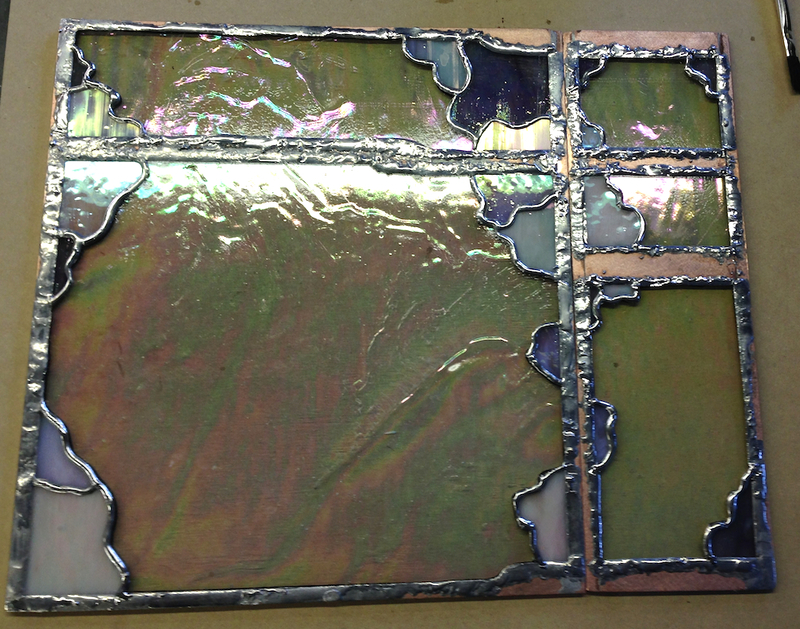 Once the seams were soldered the first one would have looked less uniform, but I like having the purple there. It’s hard to get the final effect looking at just the pieces, so I’m going on faith a little . If it looks horrible when I’m done I can always hurl it across the shop after all. 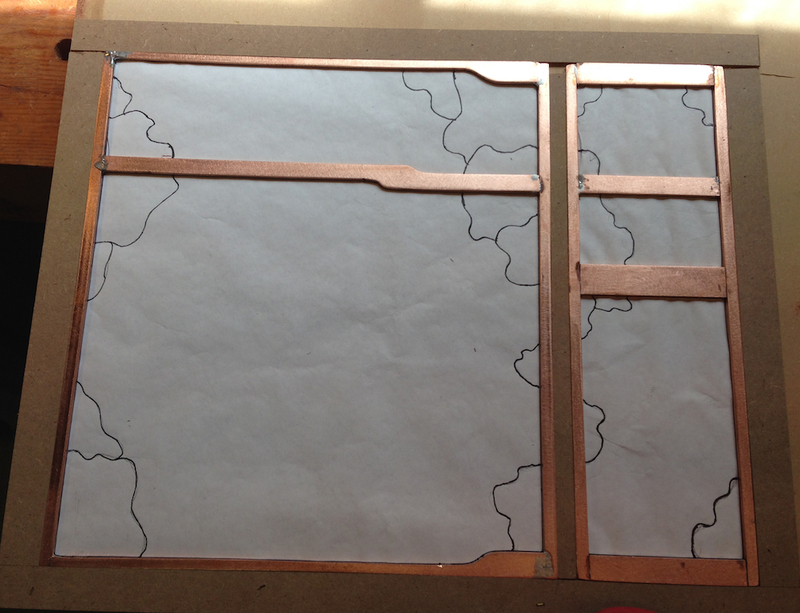 Then I started on the small panels on the right, I laid out the clear, cut and found all there panels. 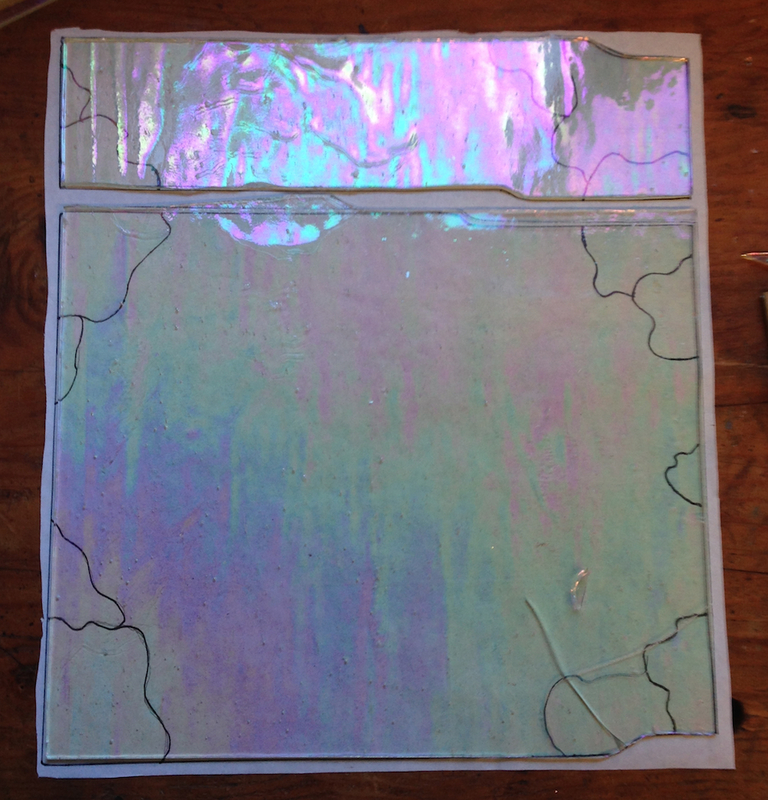 I followed the same sequence as I showed in my last post, I cut and ground the full sized pane to fit the opening in my copper framework, then I cut and ground the areas the needed to be removed for the colored areas. With some nice music on the stereo this goes really quickly. Then I started cutting and fitting the colored glass. I laid out which colors I wanted to use in which spots on my master pattern to keep it straight. Where I cloud shape should span two panes I made them the same color. Again, that effect is lost when you’re just looking at the pieces, so it important to have a master pattern with this information. So that just leaves the large pane on the bottom left. The larger panes are trickier for me, especially with glass glass like this that has inclusions and irregularities. It’s really prone to having the crack propagate away from the scored line, but I have three sheets, so I should be able to get it done. Before it got too hot yesterday and I abandoned ship to go buy a new TV (and ultimately returned to the shop to knock together a kludge to hold the TV and related paraphernalia) I made a credible start on the stained glass for the door of the Thorsen Cabinet. I started by setting up a wood frame to hold the two copper surrounds I made earlier. 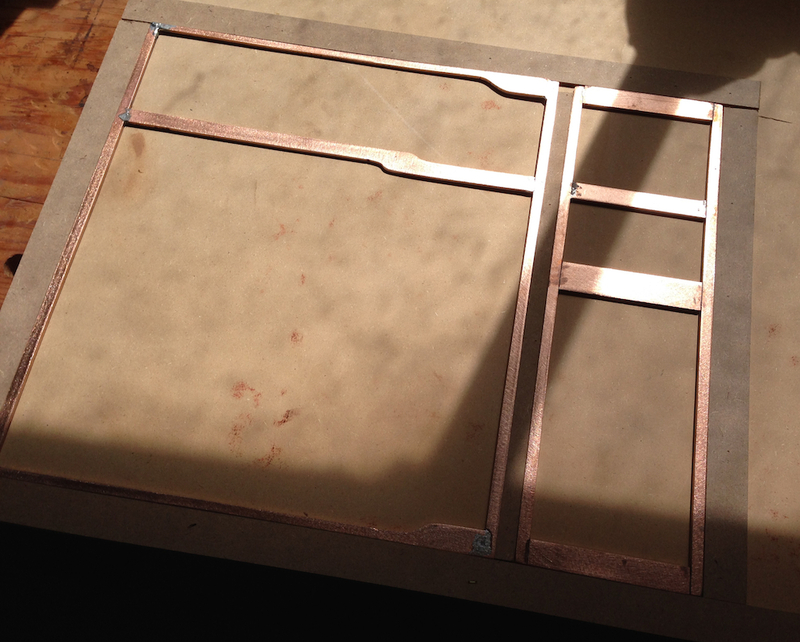 The intent with the pattern board is to hold the two copper frames in orientation as they will be in the door, and to keep from springing the sides and messing up the fit. 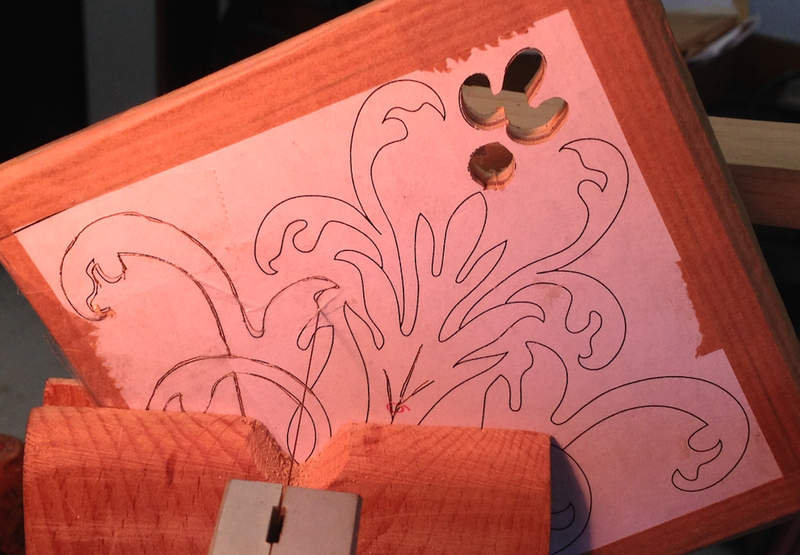 I fit some paper into the wood frame, and started developing the pattern for the glass. I traces the inside edge of the copper frame, then sketched the “cloud” design in pencil, tweaking it until I was happy with it, then I inked in with a fine point sharpie. The process for cutting the glass is pretty simple in concept, score and snap, but the reality is that curves add complexity. And the uneven texture of the glass gives it a mind of it’s own. I cut the pieces of glass for the left side first, but got a crack in the big one. That’s life, I bought extra expecting that nibbling out little pieces in a big sheet was going to be tricky. First cuts on the textured, iridized clear. Note the unfortunate crack on the bottom right. I really love this clear glass. It has a few bubbles and an irregular hand-made appearance. 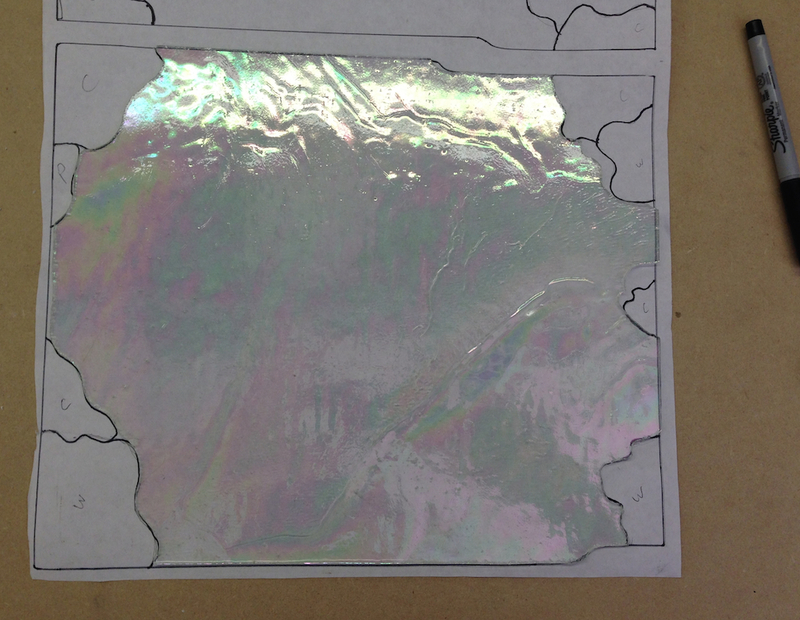 It’s “iridized”, which means it has a thin metallic coating that gives it a purplish cast. Part of why this piece got away from me is that I scored it on the front instead of the back. The back is smoother. Also the glass needs to be well-supported when scoring, otherwise the pressure from scoring will start a crack. So I ignored the bottom section and focused on finishing the top section first. I used grozing pliers to snap off any little pieces that didn’t come off and the score, then I ground the edge so it was a slightly loose fit in the opening in the copper. 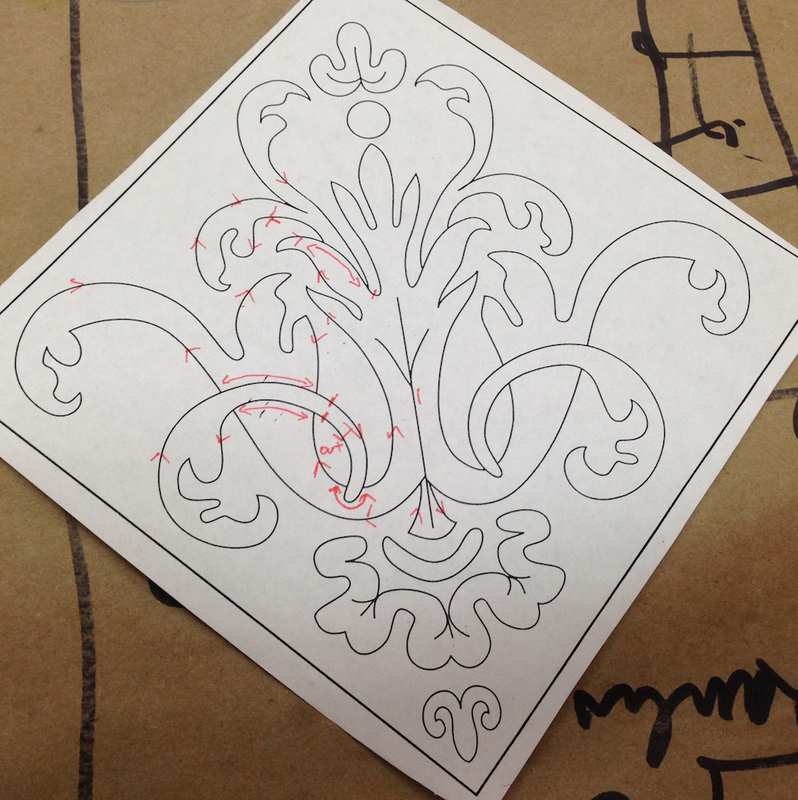 Then I laid it over my pattern and traced the cut lines for the cloud design. I flipped the glass face down and scored it in stages. First a straight or sweeping cut to get close to the layout line. This can be snapped by hand or with “running pliers”. I’ll have to do a separate post on the tools as I don’t have pictures handy. Once the first cut is snapped, I scored a service of shallow arcs into the inside curves. These will be snapped off using the grozing pliers. I’m not really very good at this, but it seems to work. If I can get within a 1/16″ of my line I’m happy. After snapping all the little bits, and repeating the cuts on the other end of this piece, I’m ready to take it to the glass grinder. 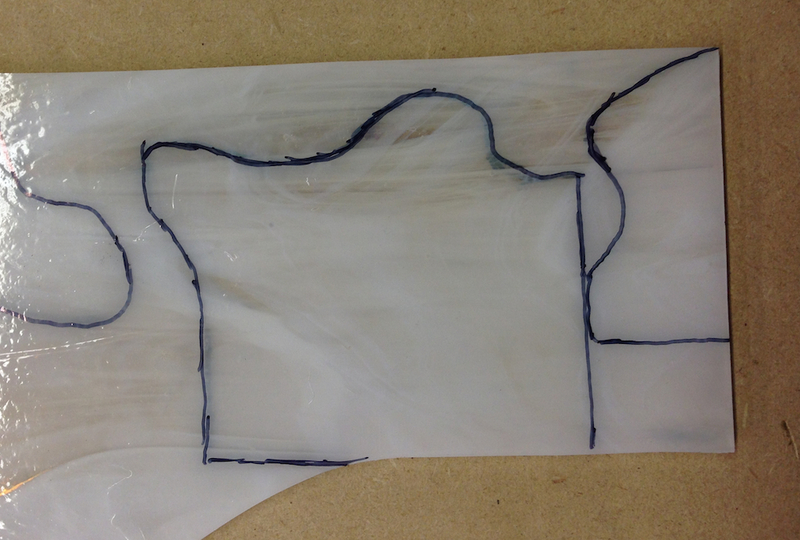 These are the three pieces of glass I got to use for the cloud shapes. I’m starting out with the one on the bottom left, which is spear, white, pink and champagne. I suspect I’ll make a few pieces in more than one color as I go through this and decide what looks best. 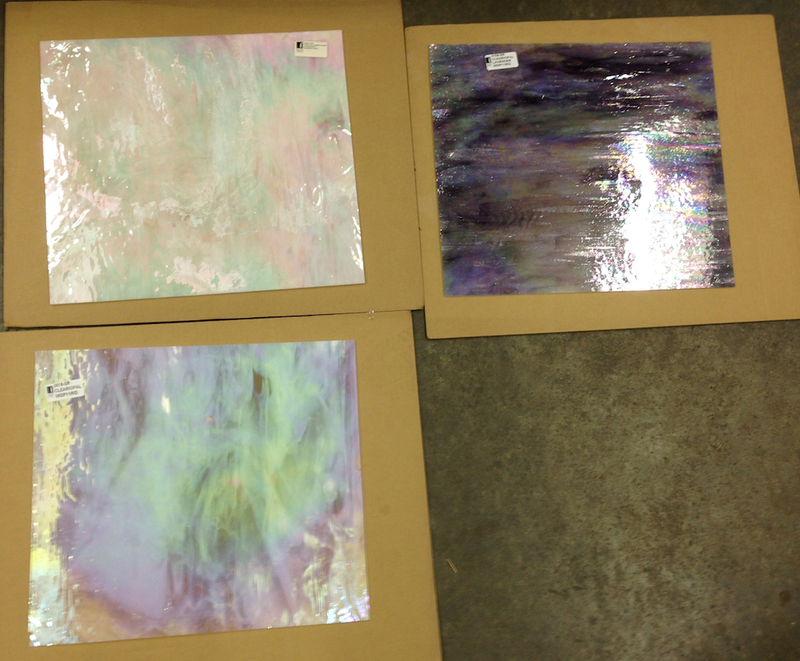 All of these have an iridized coating like the clear that I’m using. Same process for the little pieces, with a slight twist. Since the glass isn’t clear I have to use a light box to see the pattern through the glass. 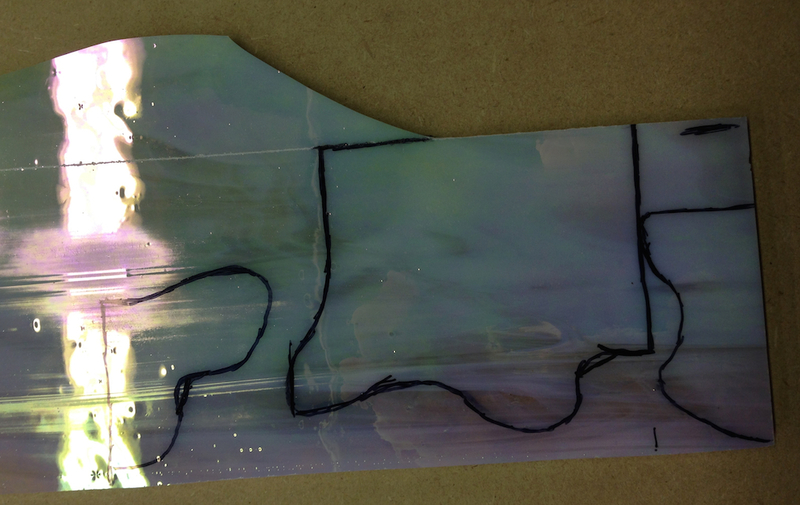 I ink it onto the front of the glass, then flip the glass over on the light box and ink it onto the back. The difference in color between the two sides is surprising. …and then traced onto the back of the glass for scoring. I score and break from the back, and grind from the front. 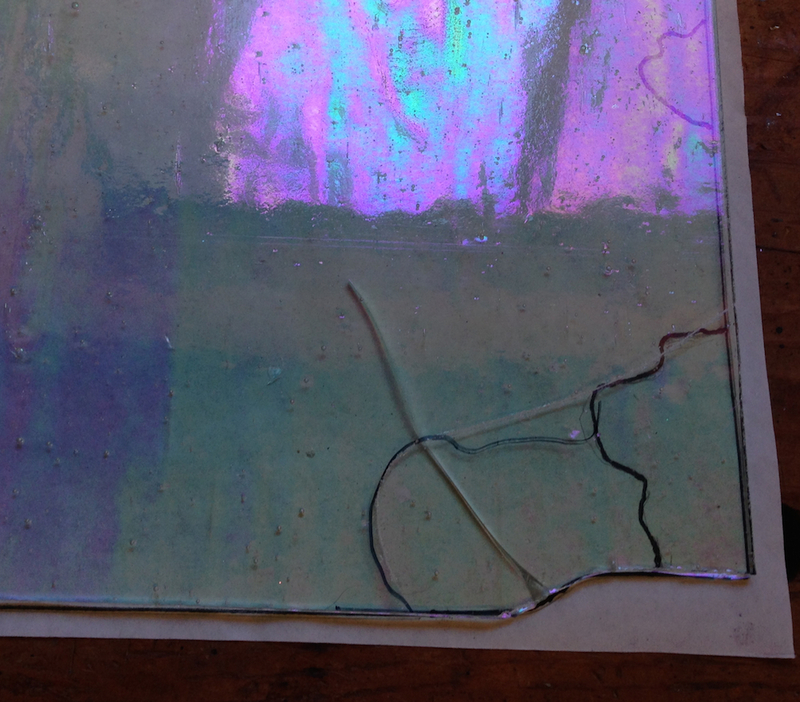 I am aiming for a slightly loose fit between the pieces — not gaps (there will be some, and that’s OK) — but enough clearance for the copper foil that will wrap all the bits. Without the lead boarder the design looks a little anemic at this point. I’m also going to re-make one or two of the parts in different colors for more variety. But this is where I left off before my son convinced me to stop so we could go TV shopping. Parts cut and fit for the first panel.